Fun-Fact: Did you know that the ever-famous Petit Beurre biscuits originates from Nantes, France? Nantes is one of the biggest cities in France, approximately 2 hours by train from Paris with very warm people, an affordable standard of living, and of course beautiful tourist attractions.
. 1. Castle of the Dukes of Brittany: Be ready to be captivated by the remarkable architecture of this castle which was once home to Francois II, the last duke of Brittany, as well as his daughter Duchess Anne (twice queen of France). It is the city’s most important and oldest historic building set in the historic heart of Nantes. It currently houses the Nantes Historic Museum which grants free entry to the public every first Sunday of the month from September to June. 2. Nantes Cathedral: The construction of this gothic edifice began in the 15th century and took 457 years to complete. No wonder it is such a beauty to behold. The Cathedral boasts of towers with arches higher than that of Notre-Dame Cathedral in Paris. It also bears the tombs of the parents of Duchesse Anne. 3. 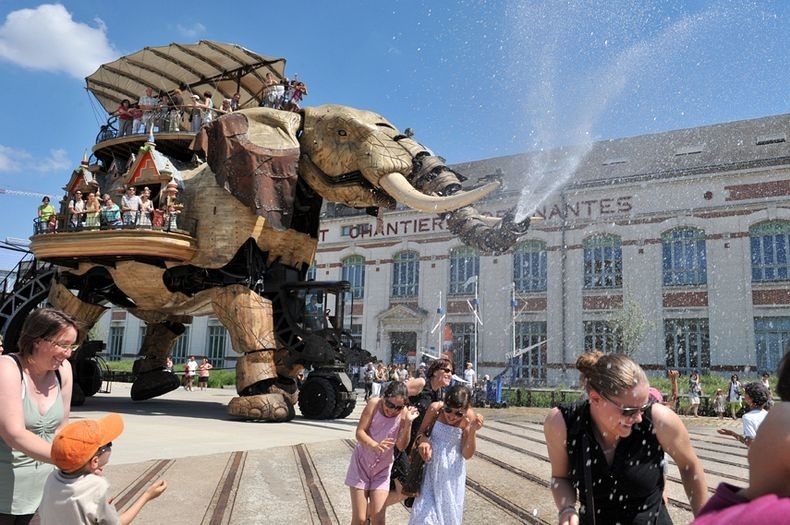 The Machines of the Isle of Nantes: Located on the ancient Nantes shipyard, this mechanical heaven is a mix of the Jules Verne fictional universe, the mechanical creations of Leonardo Da Vinci and the industrial past of the city of Nantes. You would love the Giant Elephant who stands 12 feet high carrying about 50 visitors on his back and walking majestically at a speed of 1km/h. Visitors get to spray water from its trunk to those who stand in its way. There is also a carrousel with marine characters and a machine gallery which are all worth the visit. 4. Tour de Bretagne: Pay just a euro for entry and enjoy a wonderful view of the city from the topmost terrace of this 32-floor skyscraper; or make yourself comfortable at the bird-themed bar named Le Nid (The Nest). Wonder what sitting on a huge egg feels like? Give it a shot. 5. Trentemoult: Hop on the Navibus for a short ride across the Loire River to this colourful village. Enjoy strolling through the streets appreciating the art, or sit at a cafe, order a drink or two and enjoy the serenity of it all. Magnifique ! À voir absolument !